As Senior Population Grows, A Push To Make Streets Safer For Pedestrians The nation's next transportation bill should be written with its aging population in mind, advocates say. Their concern is that with pedestrians and cyclists already at risk, adding slower-moving senior citizens to a system built for cars could form a road safety crisis. Cities like Charlotte, N.C., are moving to improve roadways for pedestrians and cyclists. Above, a street project on Rozzelles Ferry Road, which now has bike lanes and extended sidewalks. 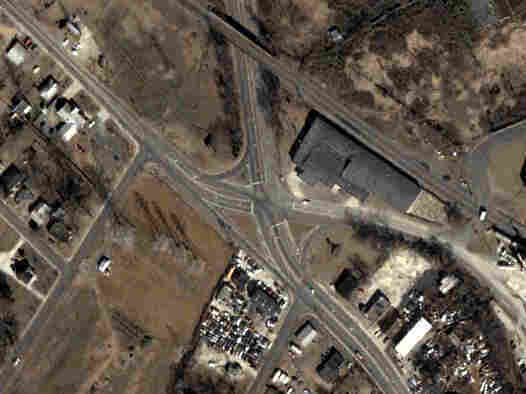 Below, an aerial photo of the intersection before work began. America is aging — a fact that advocates are pushing Congress to consider as it takes up a new transportation bill. Their goal is more safety for older Americans, on both roads and sidewalks. Pedestrians and cyclists are already far more likely to be hit by cars in the United States than those in some European cities. Add to that the coming tide of older Americans who use walking canes and wheelchairs, and some warn that a road safety crisis looms. To get a sense of the problem, I meet Elinor Ginzler of the AARP at a busy urban intersection in Silver Spring, Md., just outside the nation's capital. Ginzler isn't actually old, but she has brought along a cane to help make her point. "It's all about how you get to the other side!" she says. We step into six lanes of rush-hour traffic, and the crosswalk countdown light flashes: 20 seconds! "There are cracks in the pavement that could make it difficult for me to walk well," says Ginzler, pointing them out with her cane. "And I'm getting a little nervous, because I have 10 ... 8 seconds left, and I'm only halfway through." Frankly, Ginzler isn't faking her age very well. She's going at a pretty steady clip with that cane, and still, we run out of time just before the last lane. A turning car pauses as we hustle in front of it, passing behind as we step safely onto the curb. Ginzler says American roads were designed with one aim: to move cars quickly. Case in point? Mayvis Coyle, 82, a hero to the pedestrian safety crowd. A few years back, Coyle was carrying groceries across four lanes in Los Angeles. She was only halfway there when the light changed, and by the time she finally reached the other side, a policeman was waiting. "She was actually initially delighted to see a police officer," Ginzler says, "because she thought this person was there to help her. In fact, he gave her a ticket." The ticket included a $114 fine, for "obstructing the flow of traffic." A recent survey by AARP finds that the use of public transit by those ages 65 and over jumped a whopping 40 percent in the past decade. With the first baby boomers turning 65 this year, the nation's share of seniors will grow dramatically in the next two decades. "There's this absurdity about our transportation system in some locations right now," says Barbara McCann, executive director of the National Complete Streets Coalition. And seniors aren't the only ones at a disadvantage, McCann says. Many suburban routes have no sidewalks at all, and a number of communities resort to "hazard busing." That means busing students a very short distance because their homes and school are separated by a busy road with no easy pedestrian way. Complete Streets promotes revamping roads to make them safer for all users. So far, 24 states and 200 localities have signed on. Bipartisan legislation in Congress would require all states and regions to come up with their own such plans for future projects. McCann says a typical makeover is what's called a "Road Diet" — turning four lanes of traffic into three, with a center lane serving as a turn lane, and bike lanes on the outside. Local groups often object at first, saying the change will worsen traffic, McCann says. But "you can actually move a lot of cars at slower speeds very safely," she says. "And the time costs for the drivers are in the realm of 30 to 60 seconds." McCann says many such projects don't cost that much, but she understands that money may be a concern with budget deficits looming. Still, she's hoping for momentum, with a wide range of backers and a "perfect storm" of interests. Health groups have endorsed Complete Streets as an anti-obesity measure; environmental groups see it as a common-sense approach to countering high gasoline prices and the nation's dependence on foreign oil. In separate legislation, one congressman wants to devote half a billion dollars of the existing highway trust fund to senior safety, and not just pedestrians. "By 2025, one in four drivers in the country is going to be 65 and older," says Rep. Jason Altmire, a Democrat from Pennsylvania. He points to places like Tampa, Fla., which took on two especially dangerous intersections. 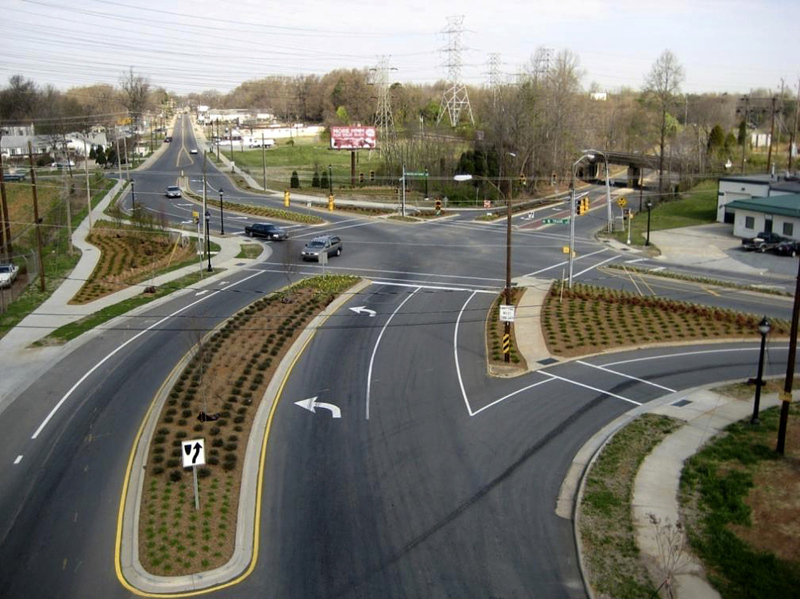 "They created what they called senior zones," says Altmire, "where they improved the lettering on the signs and the reflectivity; they improved the pedestrian crossings, and they actually cut in half the accident rate at those two intersections." But is all this Congress's job? Rep. John Mica, chairman of the House Committee on Transportation and Infrastructure, didn't return calls for comment. But Mica, a Republican from Florida, has said he'd like to get rid of mandates for bike lanes and sidewalks, not add more. In tight times, he says, states should have total flexibility to decide what kinds of roads to build — and how much time people have to cross them.